"456!" Shouted the driver out of the bus that said "NOT IN SERVICE." Some people started to board the bus. Racking my memory, I remembered that the 456 goes to Salem. I called my mother, got the a-OK, and was the last person to step onto the bus. "You getting on the 456?" asked the driver. I said yes, and he said "You da man!" Okay...thanks, I guess? There seemed to be about 20 other "da men" on the bus initially. We made our way up to Union Street, along with the 455 and 459, which also go to Salem from Wonderland and Downtown Crossing, respectively. We passed by some Chinese restaurants and at least two barbershops. We soon left the businesses of Union Street behind, though, once we turned onto Chestnut Street. And then Olive Street. And then Fayette Street. And finally, Trinity Ave, within 20 seconds of Chestnut Street. This small section of turns appeared as just a bump in the route in the paper map, so I just figured it was a typo (map-o?). Turns out it actually does it, and it felt rather unnecessary when on the bus. It's the most direct way of getting to Trinity Ave, however, so the crazy route does have to be there. We went down the residential Trinity Ave, dropping off and picking up people as we went. We soon turned onto Eastern Ave and intersected with Essex Street, the terminus of the 424 bus (a route that runs from here to Wonderland in the morning and from Haymarket to here in the evening). It seems like a fairly insignificant area to terminate a bus - mostly residential, with a few tiny businesses at the intersection. Nonetheless, the 424 joins the 456's route down Eastern Ave from here, and we continued past more houses. Not very inviting, is it? There seems to be a guy waiting at the stop, though. Eventually, Eastern Ave intersects with Western Ave (ha) with a gas station, a Dunkin' Donuts, and, to the right, swampland. Here, the 424 turns left to join with the 450 towards Wonderland, while the 456 turns right, running with the 450 for the rest of the trip up to Salem. Western Ave goes on a bridge over a pond, and then it goes back to being residential as we enter Salem. 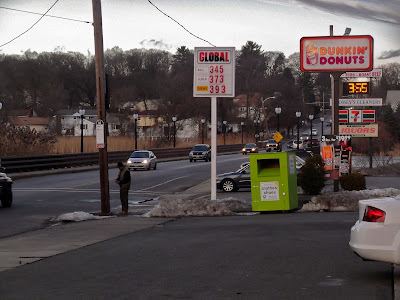 Once Highland Ave (the street name changes once we cross over the town line) widens, we enter what I dubbed The Bane of Salem - a multitude of big box stores, malls, and fast food places (including another Dunkin' Donuts). The street soon narrows, and it gets normal once again as we pass a medical center. Highland Ave becomes Essex Street, and businesses start coming up when we intersect with Boston Street and are joined by the 465 bus from Danvers. There is a short residential run before the bus enters downtown Salem, turning on Summer, Norman, and Washington Streets in quick succession. We came to the stop right in the middle of downtown, and most of the people on the bus got off. The driver closed the doors when an older couple shouted "Wait! We want to get off!" The driver opened the doors, although he yelled at the couple who paid no attention as they left the bus. A 450 to Haymarket came into the busway. I got on and spent an inner express fare. I then asked the driver when we were leaving. "24 minutes!" he responded happily. I asked if there was another bus coming sooner. "No idea!" he responded happily. I asked him if he had any schedules of the 459, the other express into Boston. "Yup!" he responded happily. Taking the schedule, I saw one left in five minutes. He pointed out (happily) the 459 as it pulled in and then said he wasn't sure when it was leaving. I knew it was leaving soon, so I left the bus. So I just wasted an inner express fare. The 459 was an older RTS bus, and so its back door got busted. The driver had to get out in the middle of nowhere and force it closed. I was one of three people who went all the way to Boston. I got somewhat lost downtown, accidentally pressing the stop request button too early. I ultimately made it to the train and home. I couldn't decide which picture I liked more, so I included both! Ridership: This is a very locals-only route. Most of the riders got on or off in residential areas, although a few people rode from beginning to almost-end, getting off at the downtown Salem stop rather than "Salem Depot." Overall, about 30 people rode, which I found surprising for a route like this. Pros: It serves a fair amount of Lynn which is only served by the rush-hour only 424 otherwise. 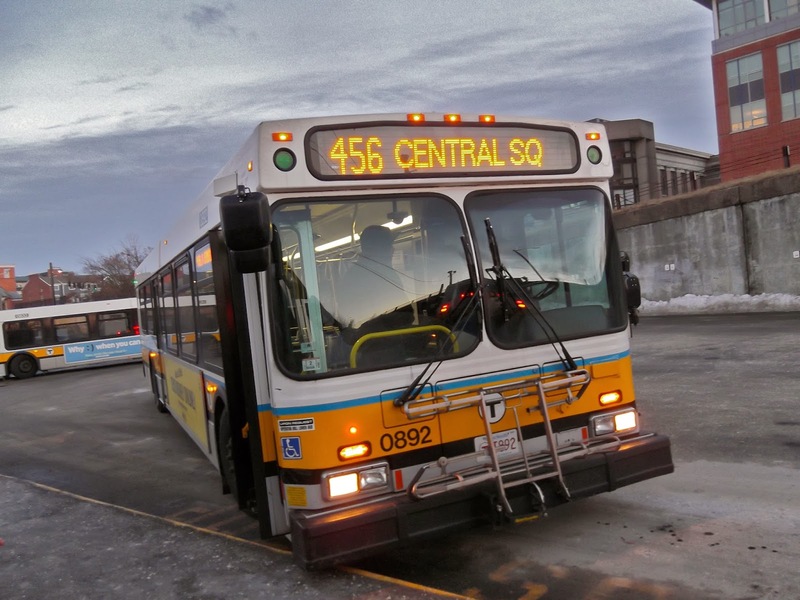 The majority of the route shared with the 450 gets a one-seat ride to Lynn which it wouldn't get without it (the 450 bypasses downtown by a lot). It also seems to be pretty well-used. Cons: Hoo boy, let's talk schedule. The fact that it runs every hour and 20 minutes from 9:30 in the morning to 4:20 in the afternoon (weekdays only, of course) means it's just a single bus shuttling back and forth. 30 people rode it! Why not add a second bus and make it every 40 minutes? Also, there's a big gap in the middle of the route where no one really gets on or off - yup, it's The Bane of Salem, and it's pointless to serve. Just look at any of the massive parking lots in front of each store in that area, and you'll see how people really get there. In terms of what's served, the 455 and 459 are much better, going through more residential neighborhoods. 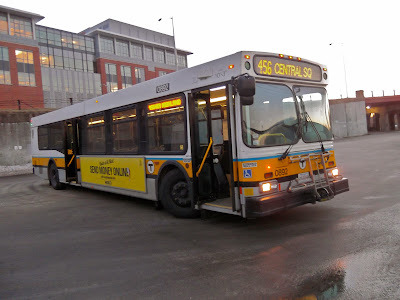 Although they do take about 10 minutes longer from Salem to Lynn, they run more often (much more often), and the 455 is your only option on weekends. Nearby and Noteworthy: There's nothing in The Bane of Salem that's noteworthy, so I would say just look at this section in the 459 post for some (specific!) attractions in downtown Salem. Yeah, you were probably expecting this, if comparing the lengths of the "Pros" and "Cons" sections is any indication. But the schedule is just so bad! Admittedly, the fact that it's midday only (a rarity for transit in general) makes it obvious that it's meant for locals, but you know...most people do their trips to town on weekends. So unless this bus is meant for derelicts (which, based on the people I saw on the bus, is not), I don't think it's very useful. Although it did get 30 riders - maybe because it was Winter Break or something? According to the Route Performance Indicators document, it ranks 152 out of 173 bus routes for ridership - not that great. Perhaps more people would ride if they added every hour and 20 minute service on weekends. Currently, it only serves as a nice connector between two fairly major cities. Latest MBTA News: The MBTA will continue to operate throughout the blizzard. Some buses will operate on Snow Routes, however, and expect delays on the subway and Commuter Rail. The Mattapan High Speed Line will operate with bus shuttles until further notice, however.